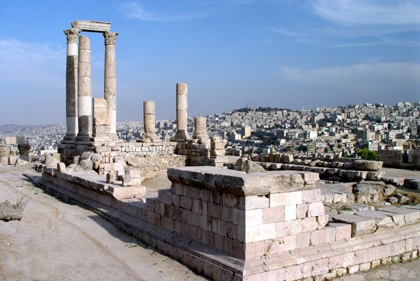 One of the most prominent structures on the citadel of Amman is the Temple of Hercules. This temple was built during the reign of Marcus Aurelius, between A.D. 161-166. The temple podium measures 144 x 92 ft. [44 x 28 m.] and was surrounded by a sacred area (temenos). This temple was built upon an older, ninth century B.C., temple that was probably dedicated to the Ammonite god Milcom. Although called the “Temple of Hercules” – Roman coins associate this demi-god with Philadelphia – the identity of the deity worshipped at the temple is not certain. Indeed one excavator believes that Astarte was worshipped here.